Michael Wozniak bought the 1970 Suzuki RE5 in 1995 while he was still a member of the Oakland Police Department. He rode it a lot, he says, and showed it, too. He took it to Alda Galbraith’s show, the Concours de Lemon…but that’s not a fair venue by which to judge this little gem of Japanese engineering. “Firemist Orange” they called this shade of orange. What’s different about the RE5 is the engine. It’s a Wankel Rotary. 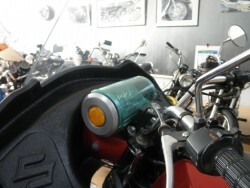 In fact, everything on the working part of the bike is round or spherical, including the tail lights and the instrument pod – which has a distinct resemblance to those tubes we used to shove through the pneumatic contraption at the bank drive-through. Not the prettiest of motorcycles in the estimation of many, it’s nonetheless an interesting one. In the few months of its production, between 1974 and 1976, it’s estimated only a few more than 6000 were made. It just didn’t go over. DKW and Norton tried rotaries and it’s rumored that Kawasaki and Honda each tested prototypes but never went into production. There was also a small run by a company called Van Veen, running an NSU/Audi engine developed for Citroén. Wozniak had two RE5s – one for parts – along with 11 other classic motorcycles. 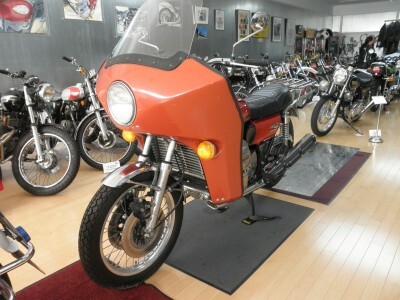 In late 2014, a fire at his home took the entire collection, with the exception of this one, in “Firemist Orange.” It was on display at an Oakland Suzuki/Honda/Kawasaki dealer and escaped the conflagration. He’d buy another, he says. We’re happy just to have the one on display. You can find a great article on Suzuki RE5s at Wikipedia under Suzuki_RE5. 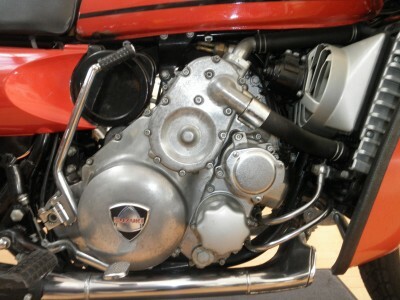 This entry was posted in Motorcycle Museum: Motorcycle Profiles on 10 May 2015 by oldgeezer. Thanks for giving your ideas on this blog. Likewise, a fairy tale rengadirg the finance institutions intentions whenever talking about foreclosed is that the loan company will not have my payments. There is a degree of time that the bank is going to take payments here and there. If you are too deep in the hole, they’re going to commonly desire that you pay the particular payment 100 %. However, i am not saying that they will not take any sort of installments at all. If you and the bank can be capable to work some thing out, the actual foreclosure practice may end. However, if you continue to skip payments beneath new program, the foreclosed process can just pick up from where it left off.